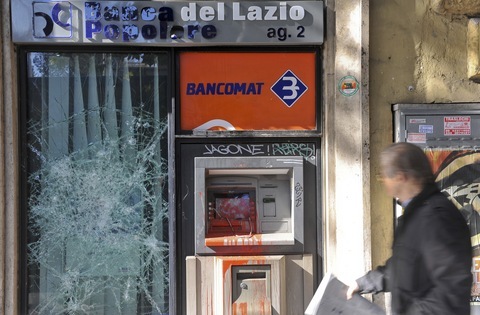 A pedestrian passes a vandalized automated teller machine (ATM), operated by Banca Popolare del Lazio, in Rome on Sunday. Photo by Victor Sokolowicz/Bloomberg via Getty Images. Following weeks of protests in New York and other cities in the United States, demonstrators took to the streets in hundreds of locations around the world in similarly fashioned protests over the weekend, resulting in hundreds of arrests. Though demonstrations were largely peaceful, in Rome riots broke out after masked demonstrators calling themselves “Black Bloc” threw rocks, attacked banks and burned cars. Prime Minister Silvio Berlusconi said those who those who vandalized “must be condemned by everyone without reservation.” An estimated 70 people were injured in the riots, which had largely settled down by Sunday after riot police got involved. In Chicago, an estimated 175 protesters were arrested after setting up tents and sleeping bags downtown in Grant Park. They did not have a permit to stay after the park closed at 11 p.m. In London, protesters converged on the courtyard of St. Paul’s Cathedral, which borders the city’s financial district. WikiLeaks founder Julian Assange told the crowd that the demonstrations were a “culmination of greed” in cities around the world. An estimated tens of thousands also marched in Madrid.